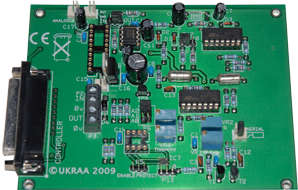 VLF receiver populated board only. The VLF Receiver output is a voltage varying with time, which may be fed to any data logger or digital multimeter. Alternatively, it may be connected to a UKRAA Controller which is managed with the Starbase software (provided free of licensing charge by UKRAA), allowing observations to be stored centrally and shared with other observers. The VLF Receiver is also compatible with the popular Radio Sky-Pipe data logging software, but extra components will be required.